Place the chicken and onion in the slow cooker. Add all the remaining ingredients in a mixing bowl and stir to combine. Pour the sauce over the chicken. Cook on LOW for 6-8 hours or HIGH for 4-5 hours. Serve with Betty Crocker™ Potato Buds™ instant mashed potatoes with some extra sauce on the side. Tart cranberry sauce and BBQ sauce make the perfect sweet, tangy glaze for tender slow cooked chicken. I love the simplicity of slow cooker dishes. There is just something so "comforting" about them. There's generally very little prep time, and you simply place the ingredients in the slow cooker and let it work its magic. Meat and poultry that's cooked in a slow cooker always turn out so deliciously tender, I love how it just falls apart at the slightest graze of the fork. And then th`ere's the wonderful experience of coming home to something that's been cooking for all those hours... the house is filled with the most wonderful aroma. But the best part? You don't have to wait for dinner, because it's ready to go! 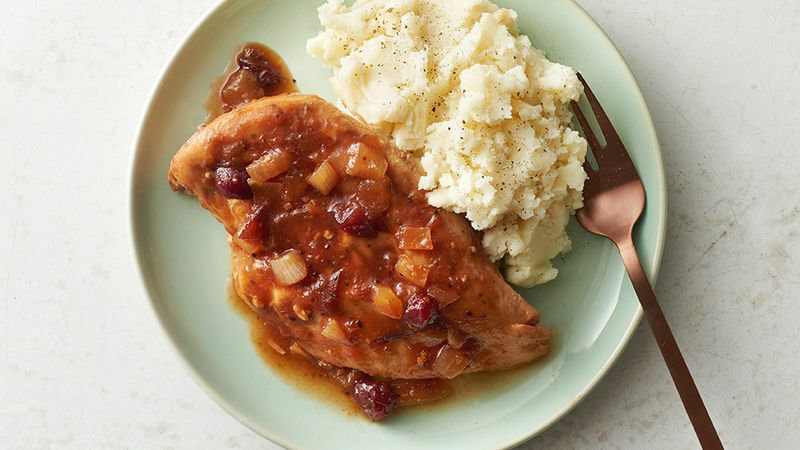 This Slow Cooker Cranberry Glazed Chicken combines some delicious holiday flavors in a dish that seriously takes 5 minutes of prep time – and no one will ever guess. Serve that succulently tender and juicy chicken with some fluffy mashed potatoes and a vegetable and you have a meal that will roll in the compliments. This recipe is so simple, you only need a handful of ingredients. Place the chicken and onions in the slow cooker, then combine all the remaining ingredients in a mixing bowl and stir to combine. Serve with Betty Crocker® Instant Mashed Potatoes and a vegetable of choice with some extra sauce on the side. For another delicious slow cooker recipe, check out Kimberly's Ultimate Slow Cooker Pot Roast! Or for more great dinner ideas check out her site, The Daring Gourmet.